Ever wondered if your dog has allergies too? Yes he does! Many dogs are irritated by overly perfumed shampoos. 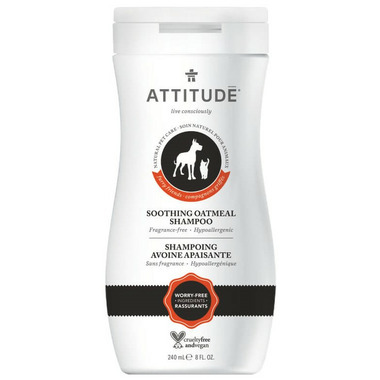 That’s why ATTITUDE’s Soothing Oatmeal Shampoo is hypoallergenic and fragrance-free. It’s made with worry-free ingredients like oatmeal, which is recommended to soothe and moisturize dry, irritated skin without exposing your dog to harmful chemicals. Ingredients: aqua sodium coco-sulfate coco-glucoside glycerin sodium chloride decy glucoside avena sativa (oat) kernel extract glyceryl oleate dicaprylyl ether sodium benzoate sodium cocoyl glutamate hydrolyzed wheat protein potassium sorbate sodium citrate. I was pleased with this mild shampoo, my dog's fur was super soft and she was not as itchy as usual. Love this product! My dog has wiry hair and the shampoo cleaned his fur well and left it incredibly soft! Amazing product! If your pet is suffering from dry skin or flakes, get this shampoo. My cat was suffering with dry skin and dead skin was coming off. I used it once and the issue is resolved! Her fur came out super soft and shiny! Love the fact that the product will is not harmful to pets, if they ingest while licking.